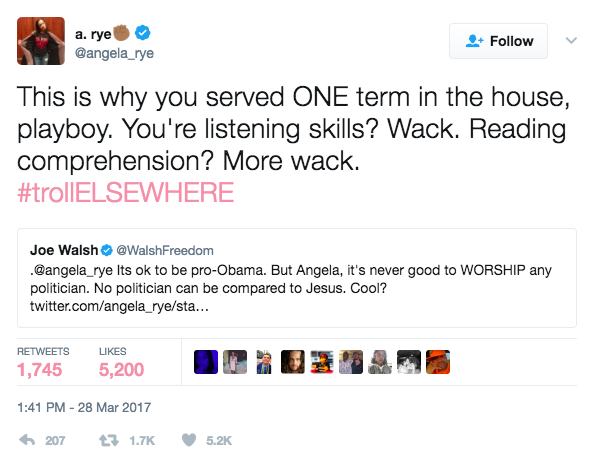 Angela Rye calls on CNN to stop giving a platform to "bigots" like Walsh. She's right. Liberal political commentator Angela Rye keeps on being misconstrued through no fault of her own. In a Tuesday appearance on CNN, Rye argued that had former President Barack Obama been accused of being the recipient of help from Russia or some other country, that would be the only thing the news media would talk about. “If this would have been under the Obama administration, there would be no end to this,” she said. She continued, adding her view that the former president had to be perfect in everything he did or he would receive criticism for it. Her response was then taken out of context by a number of conservatives who accused the Democratic political consultant of comparing Obama to Jesus Christ, something which she clearly did not do. That inaccurate characterization set off Joe Walsh, a former congressman who is now a talk-radio host after serving a single term. Seeing potential ratings fireworks, CNN producers decided to invite Walsh onto the show to debate Rye about their Twitter spat. Rye flatly refused once the camera was rolling, citing the tweets above. “I’m not talking to bigots, Joe,” Rye said, after host Brooke Baldwin asked her to respond to one of his assertions. You all decided to give Joe Walsh a platform today. I’m not giving him the time of day. I’m interested in having conversations, Brooke, that will move racial — people of all races forward in this country. I’m interested in having a conversation that will help us to admit the wrongs that were done in this country and how we move forward. I am not interested in trying to convince and change the mind of a bigot. Someone who will openly troll me and say things that are offensive, that he knows are not true. I’m tired of people telling me that black people are beneath a standard when we have to be twice as good all the time. And that is why I said I am not interested in having a dialogue with someone like Joe who has demonstrated a propensity towards bigotry. And he did that on Twitter yesterday in 140 characters or less. Too bad CNN isn't likely to take her advice.